I was born and raised in Cincinnati and have been practicing surgery here since 2000. I joined Mercy Health in 2010. My Orthopaedic training was at the University of Michigan, followed by a fellowship in Hand Surgery at the University of Buffalo. 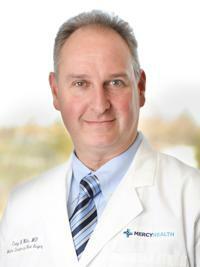 I am Board Certified in both Orthopaedics and Hand &amp; Upper Extremity. I treat all conditions of the hand, wrist, elbow for all ages.